Your meal of breakfast things stuffed into tortillas and covered in syrup is here! Did you have Taco Bell for breakfast this morning? Well you could’ve, if a waffle taco is your kind of thing (no judgment) — the chain officially launched its breakfast menu nationwide today, just like the signs foretold. Or the announcement a few weeks ago that today would be the day 5,500 chains started offering breakfast. Same thing. The waffle taco won’t be stumbling out into the big, bright world and blinking into the sun on its own, as Taco Bell has added 13 total menu items to the breakfast lineup as well, all to “make the mornings fun again,” the company whispers conspiratorially in a press release, implying that it knows fun involves syrupy waffle tacos. Other fare you can expect at your local Taco Bell: Crunchwraps with scrambled eggs, meat and hash browns; breakfast burritos; Cinnabon Delights with frosting, naturally and then orange juice and coffee for your morning beverage needs. To push the new breakfast campaign, Taco Bell has also been running ads featuring Ronald McDonald — which is actually a bunch of guys who happen to share a name with the McDonald’s foremost clown and just so happen to adore Taco Bell’s new breakfast. I believe anyone who says his name is Aaron Rodgers is an expert on football, so I suppose the same logic applies here. 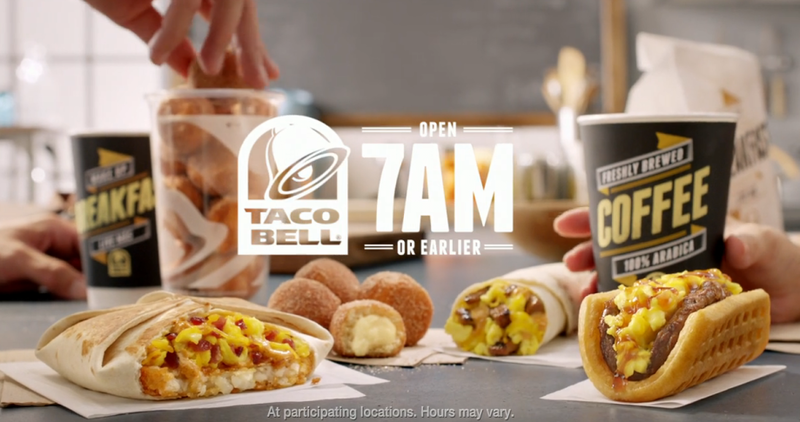 Is Taco Bell Testing An All-Day Breakfast Menu?